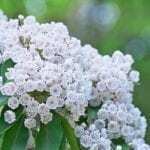 Can I grow a hybrid mountain laurel in a container in Zone 7? Growing zone is 5-9. Yes, I did find reports of them growing in large containers (20 gallon or more). They do have a large tap root, so this is often not good for container growth so the deeper the container the better. Less flowering is reported with container plantings.